I did a search and surprisingly didn't see anyone mention this (unless I'm wording it wrong) but this is a bad problem - so when it is raining and I go to say a McDonalds drive-through, rain hits the front windshield off of the McDonalds roof. The wipers (being auto-sensing) turn on and ALL of the water drips/splashes inside of the car if I have my driver side window open (which I need to pay and get my food!). I can't turn off the wipers manually so I'm pretty stuck getting water all of my driver side door. Are there any Model 3 aftermarket rain guards out there to fix this issue? Thanks! why can't you turn off the wipers manually? Because the Model 3 wipers are automatic. There is no manual setting for turning them off. Only settings are speeds 1,2,3 & Auto. no.... in the wiper 'card', you can turn them off. Correct, you can turn them off automatic but you can't actually turn the wipers totally off, thus the wipers will still be on in any mode and thus still splash the rain inside the car if the window is open. on manual, you can turn them off. there are people that are not using auto wipers, and they can turn them off. Really? 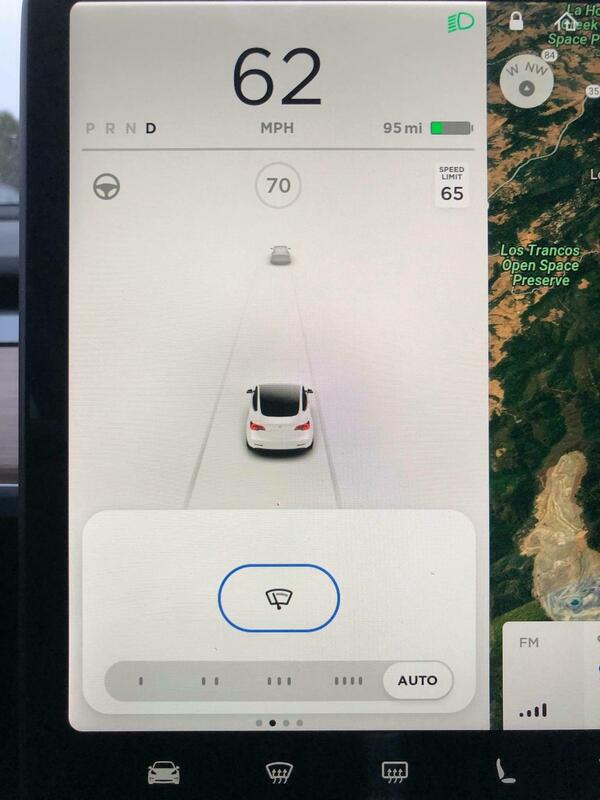 Oh I never noticed that.....I just looked at the Model 3 manual and there is a button above the speed setting to turn on/off the wipers (never noticed that). Well if that works then that will be nice, but I'd also like a rain guard solution for the Model 3. There are the four intermittent settings, as well as the auto setting. But just above that is the main wiper button. You press that to turn it completely off. If it's blue, it's on, and the intermittent/auto setting takes effect. If it's not blue, then the wipers are completely off. Yes, you can turn them off, as folks do in a car wash. And yes, you should turn them off to keep the poor individual at the drive through from getting soaked. And if you are still having problems. Open door, walk inside and order. If anyone does have rain guard suggestions though please post them here as I'd be open to that kind of mod and thank those for pointing out the wiper off button. I thought to myself, what a great idea! You have yourself a cash cow @pcenginefx ! But, as is always the case for me, someone is already making something... at least, it appears so though they don't show any pics of theirs installed on a Model 3. Yeah I saw that link from weathertech but they pop up a notice saying it is not available yet for the Model 3, but looks like my best bet. There is this video where someone demonstrates in a long talk how accumulated rain water runs into the window with no drip edge to keep it out. I experienced this yesterday accelerating out of a parking lot with the window open. Is there an aftermarket rubber/plastic strip to be attached above the window? Ideally something removable and/or invisible that doesn't create wind noise.